Fall is a great time to put down the last application of fertilizer on lawns to help promote root growth throughout the winter and also giving it deeper color later into the winter and an earlier green-up in the spring. Apply a fall application of weed control. Turf weeds are fairly easy to kill during the fall and this prevents competition with your grass. It also makes a drastic difference in how many weeds will be present the following spring. Aerate the turf. Fall aeration helps break through the thatch layer and also helps with compacted soils. It provides the space and oxygen needed to promote a healthy root zone for the turf. Mowing or mulching up some leaves on the turf can be beneficial but when the leaves really start piling up, get them to the curb. 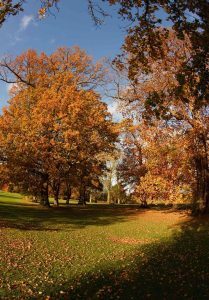 Leaves mowed up too heavy or left to sit can block light and trap moisture that will kill off the turf. Now is the time to think of color for spring. Plant bulbs such as daffodils and tulips in fall to get early spring color. Planting garden pansies is another great way to obtain color late through the fall and very early spring. Plant a tree. Trees planted now are able to overwinter and settle in, allowing them a strong start in the spring. Cut back perennial plants and remove dead annuals. Fall is the perfect time to dig up, divide, and replant perennials that have outgrown their space or just want more to plant elsewhere. Cultivate mulch beds. Use a garden weasel or hard rake to break through and cultivate mulch beds that are too thick. This allows air and moisture to get in to help break down the material and also freshens up the look till you can reapply mulch in spring. Take a look up. Now is a good time to inspect trees and shrubs for any dead wood or pruning. To save a lot of time and money in the spring, don’t forget to remove all hoses and winterize any outdoor plumbing and irrigation.